In a world with so many different cultures with divergent ideologies and beliefs, naturally there are as many ways to mark the passage of time and predict fortunes. I studied at a missionary school and the only exposure that I had to calendars was the Roman calendar. Imagine my surprise when I first heard about the Hindu calendar – the Vikram Samvat. My first reaction was ‘How can this be possible!’. The alarm was more at the idea that there could be any alternate way of marking time other than the one I was used to. No doubt I questioned the logic of having 28, 30 and 31 days in different months, the reasoning behind the numbers of months and the number of days in a week in the Roman calendar but it did not ever occur to me that an alternate method was possible. And I am certain that all through my elementary school days and even most of my secondary school days I believed the world to be only 1975 (+ or -) years old. I had no idea that this was just a calendar clock in which the ‘zero’ was reset to the year of Christ’s birth to honor him. Over time I learnt about another zero reset – the Vikram Samvat – which honored King Vikramaditya. A few years ago I learnt about the Batak calendar in Indonesia. And recently I cam across the Balinese calendar. The Pawukon calendar is used even today in Bali. It dates back to the 14th century has years of 210 days and as many as 10 different weeks running at the same time. The longest week cycle has 10 days and the shortest week consist of just 1 single day! Examples are seen in Museum Bali. These calendars painted in the Kamasan style have 12 sections. The sections probably represent the 12-months and contains the deity associated with that month. The painted scenes for each month illustrate the written predictions that are the portents of earthquakes. While agrarian cultures used calendars to predict monsoons to calculate the timing of sowing, life in the Pacific Rim islands was heavily impacted by earthquakes – making it critical to predict these rather than other events of nature. 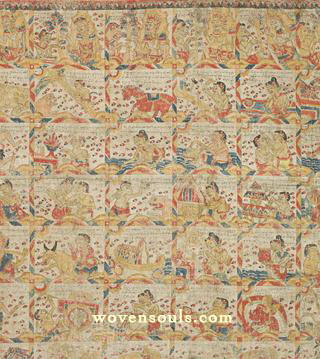 The Balinese astrological chart which is called Palelintangan distinguishes 35 signs, each with its own unique characteristics. An explanation of the various symbols is given in the PDF file below. To me these articles that combine art and culture and the most valuable of all. They are not only gorgeous but also have a story within them.They please the eye as well as the mind. And they create a connection to the past and please the soul. Every time I look out at the stars there is a yearning and a sense of impossibility. It is the same when I hear about cultures past. But pieces such as these satisfy that yearning to a small extent. It is as though I have managed to visit the unknown or the unknowable. Thanks for this interesting post about two unknown calendars! Foreign invasion had killed many traditions across the world, so sad! I have always held the view that you hold currently – that foreign invasion killed a lot of cultures. The book ‘Guns Germs & Steel’ elaborates on this subject. Of course view is not entirely unbiased – and I as a culture enthusiasts tend to view the invasion negatively. But on the other hand it does not seem logical that cultures the world over died (or are dying) at the hands of foreign invasion without any tacit or expressed acceptance by the natives of the foreign culture. And naturally every human wants to follow the ‘easier’ life that the modern technology brought in by the ‘foreign invaders’ provides. (A balanced view is offered in ‘The Ragged Edge of the World’). And so there is evolution of lifestyle and much is lost along the way. Some cultures have found ways to preserve their own culture and embrace the technological advances e.g. Saudi Arabia. Others have compromised. This subject is a minefield of pros and cons. And so I have adopted the stance of being a mere observer rather than a provider of prescription. I agree with your point. The stronger culture tends to survive while the weaker once die. But, I think, invaders’ strategy also matter! Because, Indian culture is spread all over the Asia but, it has grown along with their culture without spoiling anything. Thanks for a good discussion 🙂 Have a nice day! 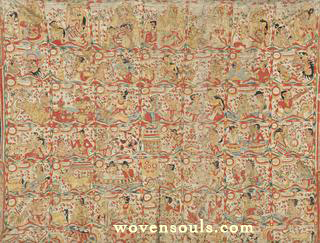 This entry was posted on December 6, 2013 by wovensouls in Culture Kaleidoscope, DAILY ART FIX and tagged antique art, antique artwork, antique Bali, antique balinese, antique textile. 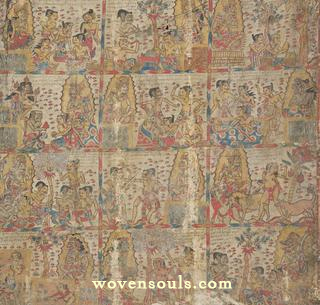 antique painting, art, artwork, Bali, Balinese, Balinese calendar, culture, date, Indonesia, Kamasan, painting, Palelintangan, Palindon, pigment, prediction, textile art, textile artwork, time, traditional.